Millions of Brits are opting for coach holidays over jet-setting and cruises, new research indicates. According to a poll by the Coach Tourism Association (CTA), over five million people from the UK go on coach trips, accounting for around £1.4 billion each year. The research shows that single decker trips abroad account for more than half of coach journeys and 40% of coaching holidaymakers are under the age of 65. CTA chief executive Chris Wales says the survey goes a long way in laying assumptions about coach travel to rest. He said: "As you might expect, coach travel is most favoured by the over-65s but almost 40% of our respondents are below that age. " "More than a third of over-65s see coaches as a luxury form of travel, which any coach traveller knows, and almost a quarter of those who don't use coaches nevertheless regard them as luxury." Anyone planning a coach trip abroad should take out travel insurance for added peace of mind. More than 25,000 people were surveyed as part of the research, with almost a quarter (24%) being "non-coach users". 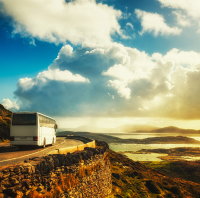 Of those polled, 92% said they would continue to embark on coach holidays, while 43% of non-users say they would consider taking a coach trip sometime in the next five years. Mr Wales added: "As well as giving us such valuable insights, the survey shows how coach tourism is on the rise. "It is tremendously popular among existing users, approaching half of non-users plan to give it a try within five years and as the UK population ages the market for coach holidays is growing significantly." Despite popular assumptions, price is not the primary reason people choose to embark on a coaching holiday, the CTA has said. "The chief reasons, in fact, were that coach holidays take the hassle out of travel and they're a sociable way to travel," continued Mr Wales. "Value for money came third and price wasn't in the top five." The chief executive says luxury coach tours are one of the most popular choices of break, only pipped to the post by all-inclusive holidays.